TURN RIGHT ONTO DELMAR STREET. 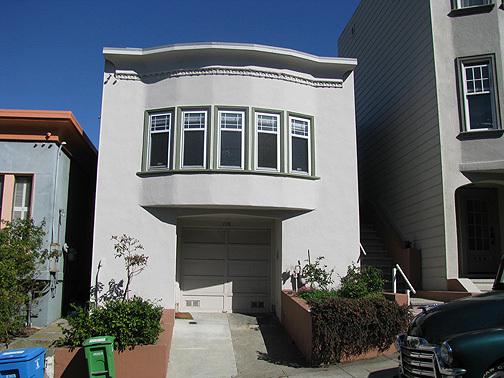 This block of Delmar provides a good opportunity to review the Haight's architectural history. But before you begin the walk down the hill, reflect on two aspects of California's architectural heritage. First, because of our abundant lumber resources almost all homes in this state are wood-framed. Secondly our cities are anti-urban. Even though most of our houses stand cheek to cheek, they are unlike anonymous row houses of Chicago, Philadelphia, New York or Boston. Delmar exemplifies these West Coast traditions. All of the houses on this block are wood-framed and there is considerable architectural diversity. 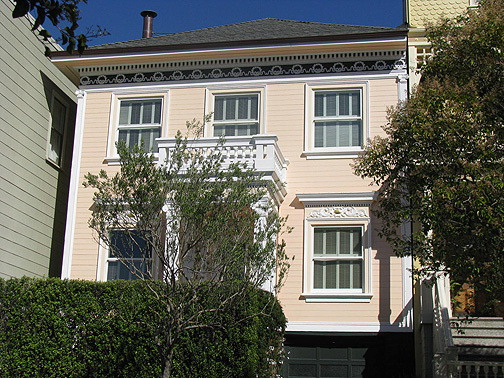 Home building on this street spanned fifty years and the various styles reflect the popular tastes of many generations of San Francsicans. Anti-urbanism was license to build homes unlike one's neighbor's, wood-framing fostered this eclecticism. 168 Delmar, in the Eastlake style. 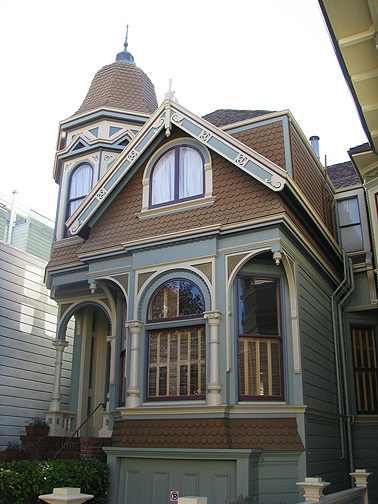 The earliest homes in San Francisco are generically labelled "Victorians." The earliest Victorians on this block are a sub-species--the Eastlakes. 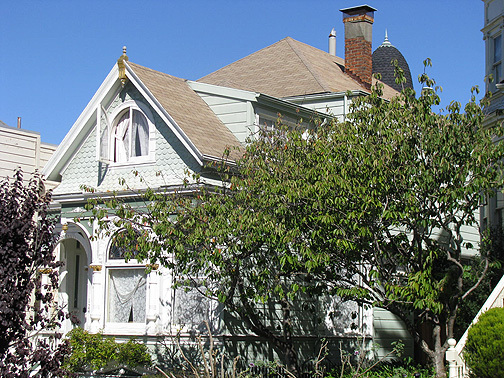 The houses at 151 and 168 Delmar Street are good examples of this style which was most popular from 1875-1890. The Eastlakes embellish upon earlier architecture. They have taken the strong vertical lines, flat facades and decorative cornices from "the Italianates" (circa 1850-1870) and the jigsaw ornamentation, patterned "sticks" and square bays from "the Sticks" (circa 1870-1875). To these they have added more exuberant carved panels and moldings which new technology had made possible. The style developed loosely out of English designer Charles Eastlake's Hints on Household Taste, but Eastlake found the application of his "hints" so offensive that he disowned the style. He wrote, "I feel greatly flattered by the popularity which my books have attained in America, but I regret that their author's name should be associated there with a taste in architecture and industrial arts with which I have no real sympathy and which by all accounts seems to be extravagant and bizarre." If Mr. Eastlake was unimpressed by his architectural namesakes he would be no more impressed with their successors, the Queen Annes (121, 124, 130, 155-57, and 159 Delmar Street, for examples). 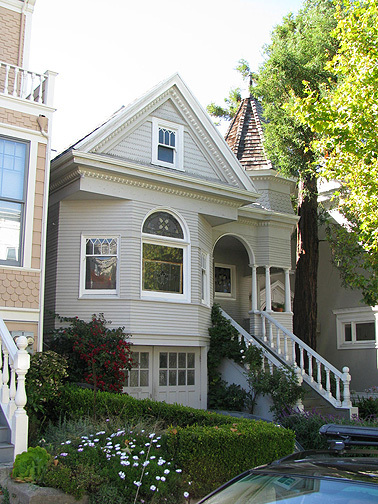 The Queen Annes are most noted for their rounded corner towers, steep gabled roofs and shingled walls. They were popular from 1890-1910. Like the Eastlakes, the Queen Annes have obscure roots in the British Isles. The English Monarch for whom they are named died in 1714 and unlike Eastlake was never in a position to disown her namesakes. 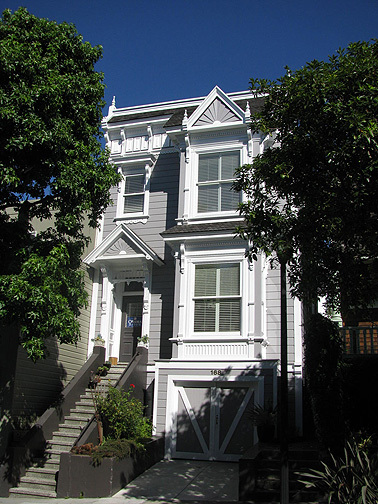 131 Delmar, Mission revival style, 2008. Carlo Middione describes living in 131 Delmar from 1968-1992, and how when he moved in the area was still being redlined by insurers and banks. 117 Delmar, Classic Revival style. 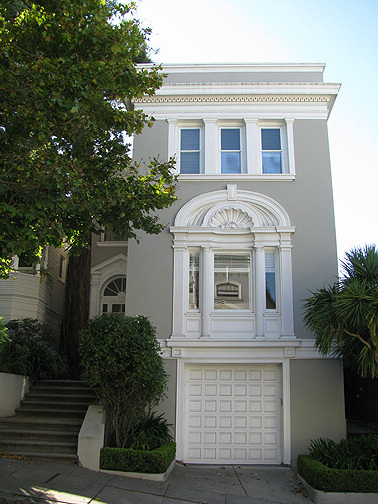 Other later architectural styles can also be found on this block: Mission revival (131 and 182 Delmar), Classic revival (117 Delmar), Colonial revival (152 and 154 Delmar), and Sunset (138 and 164 Delmar). Perhaps the Sunset homes are most noteworthy. 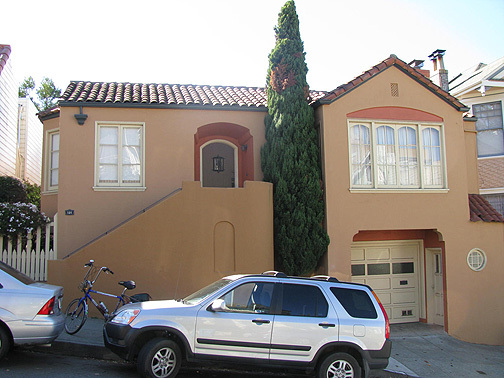 They are a common architectural form in San Francisco but rarely found outside of their natural habitats in the Richmond, the Sunset and the Outer Mission. 152-154 Delmar, Colonial Revival style. 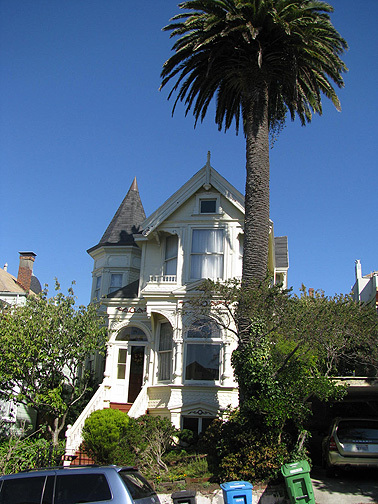 138 Delmar, the standard San Francisco Sunset style.